Twitter has moved to crack down on bot networks in recent months, claiming to have purged millions of fake accounts. Ben Nimmo, a senior fellow at the Atlantic Council’s Digital Forensics Lab, which tracks online misinformation, said the way the bots operated allowed them to “fly under the radar,” highlighting how the groups behind Twitter bots have adapted to evade bans. An example of a pro-Saudi Twitter bot. But the bots did not flood Twitter constantly, instead picking and choosing when to engage. “They’re not high-volume posters,” Nimmo said, with accounts tweeting sparingly — a strategy that may have helped avoid detection. Some of the bot accounts tweeted using a hashtag in Arabic that became the top worldwide Twitter trend on Sunday. 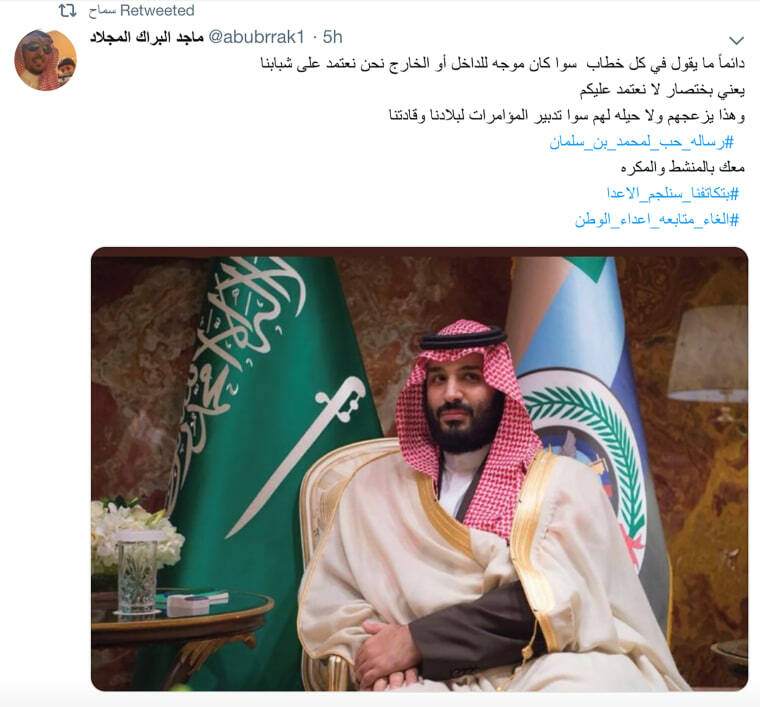 The hashtag roughly translated to “#We_all_trust_Mohammad_Bin_Salman,” the Crown Prince and putative leader of Saudi Arabia, who has come under international scrutiny following the disappearance of Khashoggi, a columnist for The Washington Post. Saudi Arabia has widely embraced social media. A study by Crowd Analyzer, an Arabic-focused social media analysis firm, found that there were 11 million active Twitter users in the country. The bot accounts pushed messages over the weekend imploring users to express doubt about news stories reporting that Khashoggi was killed at the Saudi consulate in Turkey on Oct. 2 at the order of the Saudi government, as Turkish officials have alleged. The Saudi government has denied any knowledge of what happened to Khashoggi, a Saudi commentator who was a former advisor to Saudi royals and later fell out with Crown Prince Mohammed bin Salman. Nimmo said the bots are part of a strategy to influence public perception by pushing automated, politically charged accounts into trending topics in an effort to get their messages delivered to the most people possible. The goal, Nimmo said, is to push pro-Saudi messages into Twitter’s trending topics, exposing new users to their talking points who would not otherwise them. Hundreds of the pro-Saudi accounts presented to Twitter were created within minutes of each other on Nov. 16 and 17, 2017. Dozens of other bot accounts were created within the same hour on various dates in 2012. 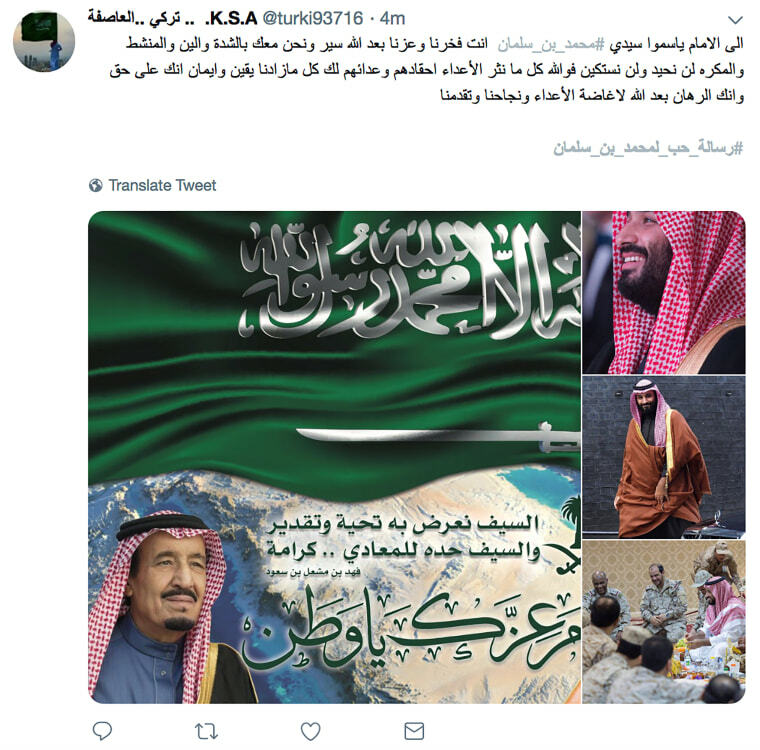 Many of the bots, which tweeted in both Arabic and English, were caught sharing identical strings of posts with a litany of pro-Saudi nationalist hashtags. One hashtag, roughly translated as “#unfollow_enemies_of_the_nation,” spread through more than 100,000 tweets over 24 hours from both real and automated accounts. Other hashtags were used to praise Saudi Arabia’s current king, Salman bin Abdulaziz al-Saud, or to spread rumors implicating Khashoggi’s fiance in his disappearance. One of the final tweets pushed by the botnet before its accounts was suspended specifically railed against Al Jazeera’s coverage of Khashoggi’s disappearance. Al-Jazeera is owned by the government of Qatar, which has been locked in a diplomatic crisis with Saudi Arabia since last year. While it was not immediately clear who created the bot accounts, researchers have noted that automated accounts have been a big part of recent news events. The conversation about the rift between the Saudi government and Qatar is frequently bot-ridden. According to The Washington Post, 17 percent of a random sample of Arabic tweets mentioning Qatar last year were sent by automated accounts. Russell found the accounts by analyzing a trove of Twitter data and finding accounts that were created on the same date and had similar numbers of followers, tweets and likes. From there, he compiled a list of hundreds of accounts that tweeted identical tweets at the same time. He called the influence operation a “standard” bot network, but was surprised at how old some of these accounts are.